Shortly after the Arab Spring rocked several capitals in the Middle East, the Turks devised a plan that would enable their country to emerge as the new Ottoman Empire. 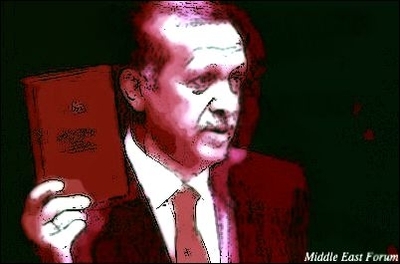 While deliberately and systematically antagonizing Israel, Ankara would: replace the Shia-controlled Syrian regime of Bashar al-Assad with a Turkey-friendly Sunni ruler; support the Sunni in Iraq and Lebanon and boost their political influence; support Hamas in the Palestinian territories and provoke it to violence against Israel; and make sure that the Muslim Brotherhood or their various brethren rule Egypt, Tunisia and Libya. Saudis were already "our Muslim brothers." Eventually, all former Ottoman lands would produce governments subservient to the emerging Turkish Empire. Nearly four years later, Syria's Assad is comfortably sitting in his presidential palace in Damascus and possibly laughing at the mess the Turks created by supporting Syria's jihadists. These jihadists have only wreaked havoc along Turkey's nearly 900-mile-long borders with both Syria and Iraq. The Shia in Iraq are as powerful as before, and remain obedient to Turkey's regional sectarian rival, Iran. The Shia in Lebanon -- where Turks are a high-value currency on the hostage market -- are increasingly hostile to Turkey. No one knows who rules Libya after the downfall of Colonel Qaddafi, but none of the warring factions want any Turks meddling in the former Ottoman colony. Meanwhile, a coup in July 2013 toppled the Turks' most-trusted regional ally, Egypt's then president, Mohamed Morsi. Today, not only the Turks but also Turkish products -- including even soap operas -- are unwanted in Egypt. With the downfall -- ironically, instead of Assad -- of their Islamist allies in the region, the Turks recently discreetly moved to win back Egypt, the most populous Muslim nation in the region. Turkish Foreign Minister Mevlut Cavusoglu asked to meet with his Egyptian counterpart, Sameh Hassan Shorky Selim, on the sidelines of the UN summit in September. The Egyptian minister abruptly cancelled the meeting, citing Turkish President Recep Tayyip Erdogan's "insulting words about [Egyptian] President Abdel Fattah al-Sisi." A statement from the Egyptian foreign ministry called Erdogan's words "lies and fabrication." More recently, Cairo announced that it would not renew a three-year transit trade agreement with Turkey. The decision indicates a further worsening of bilateral ties, which had been downgraded, as in the instance of Israel, to the level of chargé d'affaires. The transit trade agreement, signed in 2012 when Morsi was in power, had facilitated Turkish exports to African nations and the Gulf through Egypt's mainland, via Egyptian ports. Turkish companies previously sent their cargo to Gulf and African customers through Syria, when relations with Syria were normal. After Erdogan chose cold war with Syria, the Syrian route was closed to the Turks. The Turks then signed the transit deal with Egypt to use their ports and mainland as the alternative route. Now that Egypt will terminate this agreement, Turkish companies will be deprived of an easy route to Gulf and African customers. Ironically, only six weeks before General al-Sisi ousted Egypt's Islamist President Morsi, Turkey had granted Egypt a $250 million loan to finance Turkish-Egyptian joint defense projects. The loan, the first of its kind, was intended to boost defense cooperation and Turkish exports of defense equipment to Egypt. At that time, Turkey was hoping to sell Egypt scores of Turkish-made drones, tactical naval boats and helicopters. Egypt's hostile move was a "shock" to Ankara, but only to Ankara. "Apparently everyone dealing with the Egyptians knew this was coming, except the Turks," said one EU ambassador in Ankara. It was not a secret that Egypt and the Turks' "Muslim brothers, Saudi Arabia" aggressively lobbied against Turkey's failed bid in September to win the seat of the non-permanent member of the United Nations Security Council. The EU ambassador said: "There may be further Egyptian moves to retaliate against Turkish hostilities. After Syria, Iraq, Saudi Arabia, the United Arab Emirates, Lebanon and Israel, Turkey has completely lost Egypt." That mishap left Turkey's Islamists with one ideological ally in the former Ottoman lands: Tunisia, where the Muslim Brotherhood-inspired Ennahda party was in a coalition government -- until this past weekend. In the entire Middle East, Turkey now has only two allies: Qatar, which looks more like a rich, family-owned gas station than a state; and Hamas, a terrorist organization. Ennahda, the first Islamist movement to secure power after the 2011 Arab Spring revolts, conceded defeat in elections that are expected to make its main secular rival, Nidaa Tounes party, the strongest force in parliament. This defeat is a huge setback for Erdogan's Tunisian ideological allies, who had headed a coalition government with two non-religious partners for more than two years. Tunisia was the final chapter in Erdogan's book of defeat. Neo-Ottomanism was a childish dream. It is, now, a "sealed" childish dream. In the entire Middle East, Turkey now has only two allies: Qatar, which looks more like a rich, family-owned gas station than a state; and Hamas, a terrorist organization. But Turkey has a rich menu of hostilities: Iran, Iraq, Syria, Lebanon, (discreetly) Jordan, Israel, the United Arab Emirates, Egypt, (as always) Cyprus, (now) Tunisia, (also discreetly) Morocco and Algeria, and (most warring factions of) Libya. In an April 2012 speech, then Foreign Minister Davutoglu defined Turkey's policy goal as: "On the historic march of our holy nation, the AK Party signals the birth of a global power and the mission for a new world order. This is the centenary of our exit from the Middle East... whatever we lost between 1911 and 1923, whatever lands we withdrew from, from 2011 to 2023 we shall once again meet our brothers in those lands. This is a ... historic mission." That was a not-so-covert message of a strategic goal of reviving the Empire. Only nine years before the deadline to "meet our brothers" and the birth of Turkey as "a global power with a mission to build a new world order," Turkey looks rather dramatically isolated.